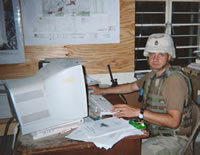 About Veteran Websites - A veteran owned company. Veteran Websites and First Capital Web Services are proud to be veteran owned companies. Our owner, Bob Hinkle, retired after serving 22 1/2 years in the United States Army. 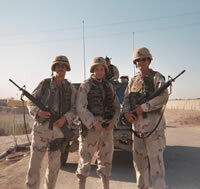 Most recently Bob served as a 95B Military Police Platoon Sergeant (E-7) with the 443rd Military Police Company located in Gettysburg, PA and deployed with the unit as part of the 18th Military Police Brigade to Iraq in 2003. Bob also served in several other units during his military career including Company C, 1/314th Infantry Battalion, 157th Infantry Brigade as an 11B infantry squad leader, Company B, 6/68th Armor, 157th Infantry Brigade as a 19E tanker and the Combat Support Company, 1/13th Armor Battalion (1st Armored Division, Illesheim, Germany) as a 19D Cavalry Scout. When Bob returned from Iraq, he became a life member of the Veterans of Foreign Wars and serves as Quartermaster of his local VFW Post in Spring Grove, PA. Bob has earned recognition as an All-State Quartermaster three times since joining the post. Bob is also a member of the American Legion. After being deployed a total of 24 months following September 11th, Bob's civilian job was no longer available to him when he returned from active duty. After several attempts to find employment he decided to start his own business with his wife, Tina, designing and hosting websites. With Bob's extensive background in computers and computer network infrastructure and Tina's background as a commercial artist, the new venture was a perfect fit for both of them. As a veteran owned company, First Capital Web Services wanted a way to support fellow veterans and established Veteran Websites as a way to provide low cost websites to all non-profit veterans' organizations. 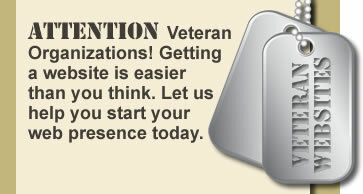 As such, we offer free website templates for use by non-profit veterans organizations, regardless of their location. Website design can typically cost several hundred dollars and in some cases, several thousand dollars per site. Likewise, website hosting fees can become cost prohibitive to non-profit organizations as well. With Veteran Websites, posts simply pay a modest one time setup fee to have their personalized content added to one of our free templates and then pay the annual website hosting fee, which can be as low as $8.25 per month depending on the website package selected. We believe this makes a post website affordable for all veterans organizations and allows all posts the opportunity to have a presence on the world wide web.